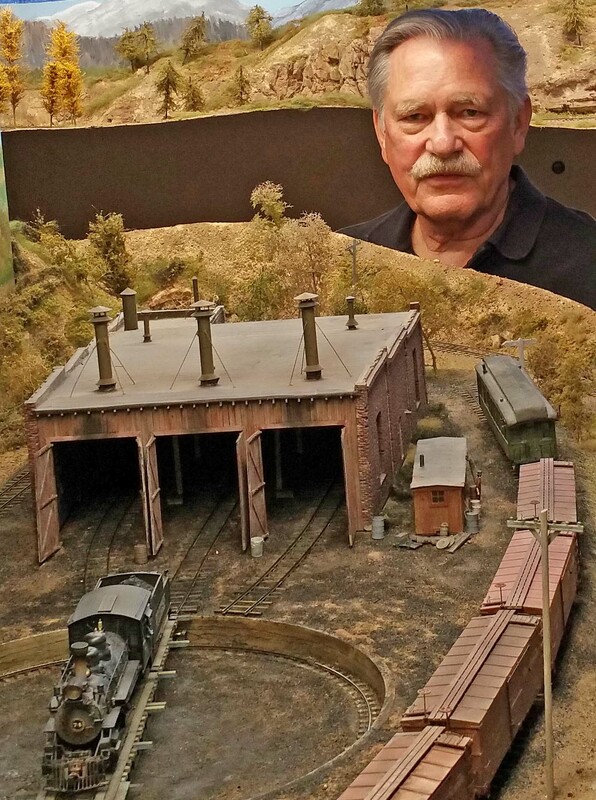 The model railroad described herein exists no more, except on this website and in my memory. We have moved to Santa Fe and are in the process of remodeling and otherwise preparing an older home into our next and final home in the hills south of Santa Fe. As part of this renovation, we will be constructing a small stand-alone structure to house the new model railroad, using a theme similar to the one documented here. We’ll occasionally share the ongoing work in this venue as the layout develops. The new website is: www.turquoiseline.com . It is now active and will be updated as construction proceeds. I have decided to switch my model railroading interests to the Denver and Rio Grande Western from the Rio Grande Southern, which historically was closely allied with and owned by the D&RGW. Since the D&RGW was much larger, more spread out geographically, and more well known, this should give my modeling “license” more room to roam, now that I have essentially completed my model railroad layout emulating the now -defunct Rio Grande Southern. Any resemblance to the original is strictly accidental but also intentional, since I have attempted to keep the visual flavor of both railroads intact in my modeling. For me, modeling is more art than science, although at some point it is necessary to keep the trains on the rails in the interest of partial historical accuracy. The map below shows the total D&RGW system, and the RGS is the pinkish looking line that runs between Ridgway and Durango in the southwest corner of the map. The part between Durango and Silverton is still running as a tourist line, remarkably called “The Durango and Silverton.” A portion of the eastern part between Antonito and Durango starting at Chama (not shown) is now the “Cumbres and Toltec” tourist line. Both are “must-sees” for railroad fans. However, they were so intertwined, and so much alike, that many of the scenes and structures will remain the same. I have also elected to keep the introductory page with the verbiage from the previous website (as well as the URL) to bridge the chasm between the two similar railroads. The quote below from Lucius Beebe and Charles Clegg is an almost perfect representation of the mood I intended to create, and they wrote this in the 1950’s (or 1940’s) during the impending demise of both railroads. This website is subject to almost constant change. Welcome aboard for the ride! The Rio Grande Southern, part of the parent company Denver and Rio Grande Western during much of its existence, was a narrow gauge railroad located in southwestern Colorado that existed from 1891 to 1952. It was built to access the newly discovered mineral deposits in that area, and ultimately opened up the vast area it served to other markets (livestock, lumber, and tourism) and helped develop that area through its sixty year history. It ran from Ridgway in the north to Durango in the south, connecting in each place with the Denver and Rio Grande Western, another famous narrow gauge railroad. The railroad was only profitable for a short time in its early history in the 1890s, and spent much of its life struggling to maintain itself through two world wars and a depression. “The outstanding characteristic of the Rio Grande Southern Railroad was its complete and overwhelming improbability. Except for the evidence of photographic record, it would be possible to doubt it ever existed, and the doubt would be amply justified. Except in the extravagantly optimistic railroad thinking of the time and place, the Rio Grande Southern could never have come into being. In the biological sense of the word, it was a sport, valiant, lonely, tenacious beyond the call of duty or reason. Say its name with bugles in the lexicon of the Old West, for the Rio Grande Southern was a lost cause, an allegory of futility when it was first conceived and it ended its long, unquiet life contributing to the essence of the destruction that was Hiroshima. “Perhaps in the Valhalla of railroads where the lights on the tangents are green forever, the Rio Grande Southern has achieved some tranquility and repose. They will be wholly out of character. “When, in years to come, men shall name the names of sparkling romance that are the lexicon of the Old West, the names that clutch at the heart and have entered the stream of the nation’s consciousness, the Alamo, Tombstone, Dodge City, the Staked Plains, Santa Fe Trail, South Pass, Union Pacific, Deadwood, Wells Fargo and Virginia City, they will be well advised to include in that valiant tally, the name of Otto Mears’s masterpiece, the lonely, desolate, and perhaps futile but still transcendingly triumphant Rio Grande Southern Railroad. I have never heard this magnificent railroad summarized so poetically. My fascination with the Rio Grande Western is not only due to its extremely beautiful and rugged locale, but also because it represents for me the foresight, grit, determination, creativity, and hard work required to build, maintain, and operate it, all of which qualities I greatly respect and honor. I hope you enjoy this homage to a uniquely American railroad. I have included a short essay on the links between narrow gauge railroading and the American West written by me as part of a creative writing course at the local community college. You can access it at An American Story. Michael McCaffery at michaelmccaffery@outlook.com .